Attacking an enemy portal is the process of destroying its resonators. When all of its resonators are destroyed, the portal is neutralized, ready for you to capture for your own faction. Attacking a portal requires the use of XMPs or ultra strikes. 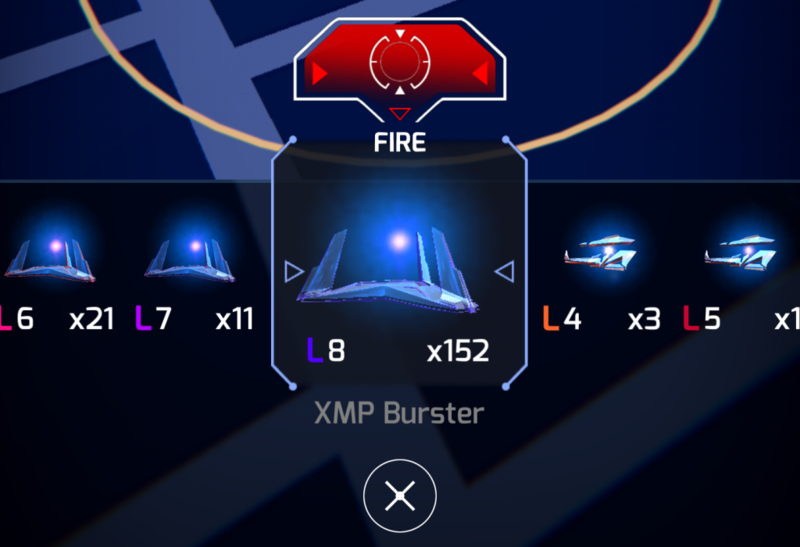 Firing one of these weapons will drain some of the XM energy from each enemy resonator in its blast radius; the percentage of damage incurred is displayed above each damaged resonator. When a resonator’s energy is drained completely, it is destroyed. Each resonator you destroy grants you 75 AP. When all the resonators on a portal are destroyed, the portal is neutralized. It will turn red briefly, then fade to gray. The portal is then ready to be captured. Swipe left or right on the carousel until the desired item is inside the brackets, then tap the “Fire” or “Use” button. Like all leveled items, you can only fire weapons or use power cubes at your level or lower. Firing an XMP or ultra strike will damage all resonators within the weapon’s range. You can increase the damage inflicted and the chance of a critical hit by charging up the weapon before firing it. To do this, start by holding down the “Fire” button. You’ll see a charging animation, with a circle repeatedly shrinking towards the center. Release the “Fire” button when the circle is as small as possible for bonus damage of up to 20%. Higher level weapons have a faster charging animation, making it more difficult to hit 20%. …where D is the amount of damage dealt, Dmax is the maximum damage the weapon can inflict, R is the range to the resonator, and Rmax is the maximum range of the weapon. Occasionally you may score a critical hit on a resonator with an attack. If this occurs, the affected resonator will take double the normal amount of damage. A critical hit is indicated by a highlighted damage notation in your scanner, with an exclamation point (!) in front of the damage value. When the portal itself is within range of the blast, critical hits can also be scored against mods; which can cause the mod to be “stripped” from the portal. The chance of this happening depends on the mod’s “stickiness” property. Most mods have no stickiness, meaning any critical hit will destroy the mod. However, the higher the mod’s stickiness, the more likely that it will deflect a critical hit. Note that all mods will be destroyed when a portal is neutralized, even if the last attack was not a critical hit. When all of a portal’s remaining resonators are close to being destroyed, any links or control fields anchored to the portal will drop. If you cause this to happen by firing an XMP or ultra strike, you will get 187 AP per link and 750 AP per control field. The damage inflicted by the portal may be increased if it has force amps installed, and turrets will increase the frequency of its attacks. If the portal scores a critical hit against you, the damage is doubled. At low levels, you generally want to focus on building rather than attacking; most portals will be too strong and you don’t have access to higher-level weapons. However, if you find a portal with only low-level resonators on it (or higher ones whose XM is mostly depleted), you can try taking it down. At this level, you will always want to stand directly on a resonator when attacking to inflict maximum damage on it. But it’s better to get together with a higher-level agent: let them knock stuff down, then you deploy. At higher levels, you have access to stronger XMPs with greater range. At that point, it starts being more advantageous to stand closer to the portal itself rather than directly the resonators. You will be able to do good damage to all its resonators at once, and you’ll destroy mods faster. At agent level 8, assuming all resonators are deployed at maximum range, it’s usually most advantageous to select the three highest level adjacent resonators, stand approximately halfway between the portal and the middle resonator of the three, and fire level 8 XMPs. Those three resonators and the portal itself will all be within the maximum damage zone of your XMP, and all remaining resonators will be in the 50% damage zone. Links and portal shields increase a portal’s mitigation, reducing the amount of damage resonators take and making it harder to neutralize the portal. Note that mods may be stripped off at any time during an attack, but links remain until the portal’s nearly dead. This means that link mitigation tends to be more “durable” than shield mitigation. The plus side of this is that neutralizing one of the two portals supporting a link will reduce the mitigation of the other. Attacking the weaker portals first in a heavily-linked cluster will help soften up the stronger ones. Before firing your XMPs, it can be beneficial to strip defensive mods from the portal. It should be noted that a portal will only retaliate when you damage one of its resonators; it does not retaliate if only the portal itself is in range. This makes the ultra strike the ideal tool for destroying mods because of their narrow blast radius and increased likelihood of critical hits. When standing directly on a portal, you can strip its mods without retaliation if the resonators are deployed far enough away. (The maximum ultra strike range is 30 m, while the maximum resonator deploy distance is 40 m.) Even low-level ultra strikes can do a decent job at stripping mods. Ultra strikes, with their increased damage, are also good at quickly taking down individual resonators, rapidly dropping the portal’s level and reducing zap damage inflicted by later attacks. Without mitigation, a level 8 ultra strike can one-shot any resonator level 7 or lower if you stand right on it, or even a level 8 resonator if you get a critical hit. Keep in mind the range of your blast. As higher-level weapons have greater blast radii, they more easily hit multiple portals, meaning that you can be attacked by more than one portal at once. It might be tempting to stand in the middle of a field and drop a huge XMP, but you will have the entire field of portals attack you at once, and you’ll be out of XM very fast, obliging you to recycle items or use power cubes to continue the attack. One way to reduce XM drain is to find an edge where only one portal can hit you then start working your way around the edge of the field destroying the resonators. As the resonators are destroyed, the portal’s level will drop, weakening its counterattacks. Let your splash damage weaken the portals ahead of you. This method will, however, cost more XMPs, since you are not using the full potential of your blast radius. One way to attack heavily linked and shielded high-level portals without using power cubes is to attack until you run out of XM, then recycle XMPs one or two levels below your own level until you have just enough XM to fire again. Any damage the portal can deal to you will be wasted, since after firing you’ll have little to no XM to lose. On 17 January 2013, XMP range was drastically reduced. For example, a level 8 XMP’s range went from 400 m to 168 m.
XMPs began costing XM to fire on 18 April 2013. The ultra strike was introduced on 1 August 2013, but was only hackable on certain Motorola devices. They became hackable by all agents on 8 May 2014. Attacking became an action accessible directly from the ops menu with the release of Ingress Prime on 5 November 2018, as the long-press menu was removed.